I’ve got a killer cold, marked by a sore throat that has made it nearly impossible to swallow. Here, in California, I had to track down an urgent care clinic (my doc was booked for days), pay an arm and a leg, get a prescription for a liquid to numb my throat, go to the pharmacy to get the medication, and then wait 24 hours while they ordered more of it because it wasn’t in stock. Fortunately, the medical system in France is very, very different than ours. 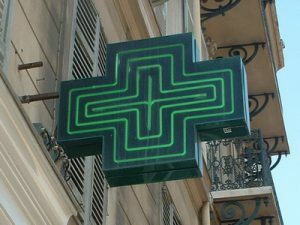 When one gets sick in France, you first go to the pharmacy. French pharmacists are trained to recognize routine illnesses and prescribe the appropriate drugs to treat them. It’s only for more serious matters that the French go to a physician. And that’s true even for visitors to the country: Tourists are able to get needed treatments simply by speaking with a pharmacist for a few minutes (and most speak English). Had I been in Paris, I would have just popped into my neighborhood pharmacy, gotten the necessary meds, and headed home to hunker down and feel better. Can you imagine how convenient that would be if we could do that here? This entry was posted in Health Care and tagged Pharmacy by Bob Adams. Bookmark the permalink.